Well friends it's Monday again. For a three day weekend I sure feel like I didn't really have one! It was a busy one between the Fair on Friday, some stuff with our music group and then having some relatives in town of the Pants Monkey's. Last night we crashed with a bunch of shows and I totally zoned out and it was wonderful. But it is Monday and Inspiration Monday at that! Today we have Jessica Alba, she is a pretty stylish lady! I didn't opt for a jacket like she has on, because it's gotten a bit warm again! Instead, I went for the overall color scheme. I really liked how this turned out, kind of a shame I really didn't get to wear it anywhere fun. It gave me a chance to play with some of my new jewelry - I promise a Vlog is still coming. I was having some syncing issues with my laptop camera. Mr. Monkey is going to help me fix it, so I will still be sharing my goodies soon! I can pretty much tell you I'm in love with everything. Speaking of love, I'm feeling the love this morning, the fantastic Megan of the Fashionable Bureaucrat has gifted me the Liebster Award - very sweet of her. I am going to answer her questions because I am a survey junkie! It always helps you all get to know me better too right? And these are pretty unique! 1. Where would you bury hidden treasure if you had it? I suppose my backyard, but that seems too obvious, so maybe in one of my favorite places in Northern MN. But why would I tell you? It's MY treasure. Mine. 2. Do you currently have all your organs? Sure do! I am an organ donor should something ever happen to me (God forbid) but I even have all my non-essential organs like my appendix. 3. For a pet, would you rather have a crow, a fringed lizard, or a taxidermized wolf? How about a fringed lizard. That just sounds fun. And kind of fancy. 4. Slips - yes or no? Yes. Though I don't use them much, I find they do help a lot in the winter months with static and long skirts/dresses. 5. If you could hire one of the following for one year which would you hire? House cleaner, personal chef, massage therapist? I can only pick one??? Aw man! Well, The Pants Monkey is a really good cook, so I don't think I'll choose the chef. I don't mind cleaning that much actually. So I think I'll say massage therapist. My back would be happy all the time. 6. Fruit pie, cream pie or cheesecake? Ooh they are all yummy, but I will say fruit pie. I love apple pie and peach pie the best. 7. If you were on Jeopardy and got the Daily Double, would make it a true daily double? Depends on how far behind everyone else I was! I probably would. 8. Did you ever wear braces? If yes, are your teeth still straight? Yes I did. And no they aren't. I'm pretty ashamed of it actually. I should have gone for the permanent bottom retainer, because those are the teeth that shifted the worst. 9. Favourite decade - 1970s, 1980s, or 2000s? 1980's - I was a kid in the 80's and everything was better then! Awesome television, cartoons, toys. Fun stuff. 10. Do you prefer routine or variety? I am such a creature of habit. I prefer to stick to a routine. But I like variety when it comes to things like meals I eat, clothes I wear, places to visit. I guess for a daily schedule I like routine but for various activities variety is fun. 11. Do you sleep with your bedroom door open or closed? Closed. I love them kittens, but they do not know how to let us sleep at night! There you have it. I'm just going to tag everyone who is reading because I love you all and would be interested in anyone's answers to the very same questions! Thank you again Megan! And thank you all for coming here and sharing in my life, it means the world to me. Please go visit the two birds blog to see other Inspiration Monday outfits! 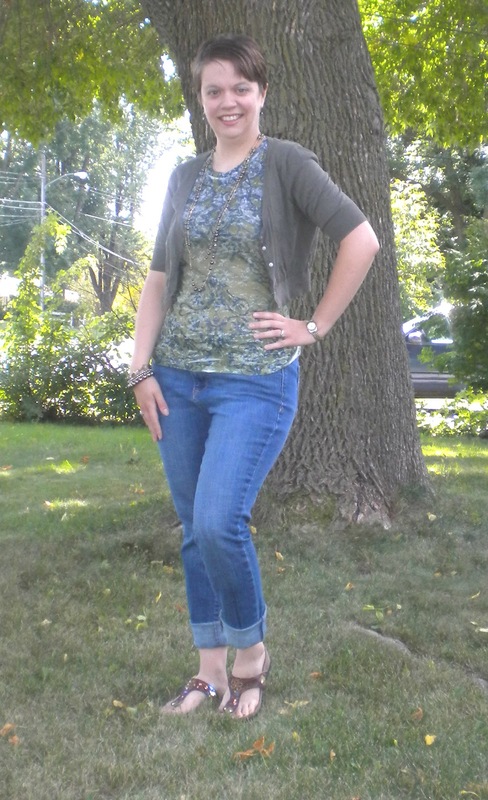 I love your outfit and great to learn some more about you:) Lovely post! Cute outfit! I like your answers - we have learned to sleep with the bedroom door closed too. Super cute outfit and I love the jewelry! Got to know a couple things about you that I didn't know (I had no idea that was even possible! ooh, those are good questions! i love them and your answers really tell a lot about you! how about a massage therapist who cleans??? Your outfit is really adorable with the cropped sweater and the new jewels! Congrats on the award, Beth! Our bedroom door stays closed too because of the dogs...they try to sneak in there! My teeth are no longer straight either :and I wore braces for 2 years, le sigh! I would love a personal checf but a masseuse would be fab too! Can't wait to see another vlog and I love your sandals, so pretty! 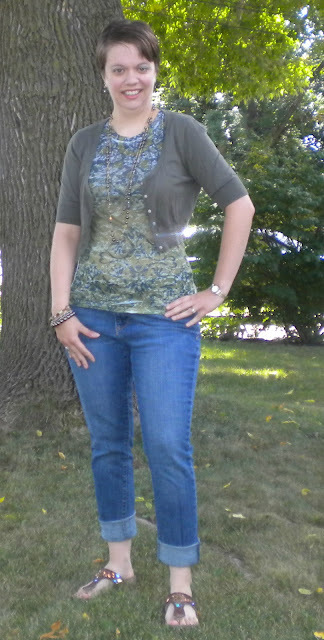 Love this color scheme for almost-fall. And I love your answers, I'm a creature of habit too. I like a schedule, but I'm also impulsive. I try to keep a healthy balance. I would probably also pick the massage therapist because I like cooking and cleaning, but have chronic pain. Ugh. I actually miss sleeping with my kitties. I still prefer to sleep with a closed door, but my kitties have always put off ~sleep vibes~ and made me sleep better. It's hard not having one around any more. 1. Ugh, I hear you on the braces. I ended up having them for the second time. And have a permanent retainer top and bottom. And wear a temporary retainer every night. I was told on Friday, at my last check up (hopefully ever!!) that I could go down to wearing them every second night and I refused... I'm not shelling out that cash again!! 2. I love sleeping with the door closed. I'm too afraid of monsters (Yes I am 6. And Yes, I don't think monsters can open doors). However, our bedroom door doesn't just stay open a crack. It springs open, and makes a loud sound. Since I like to fall asleep with the TV and my husband hates it (and since I need to be up before him), I can't have the door closed when I go to bed otherwise the door slamming open wakes me when he comes to bed! I haven't owned a cardigan that short in YEARS. Makes me realize how many long ones I own, haha. I am amused by your place to bury treasure... though I ALWAYS sleep with my door almost-but-not-quite closed.